On November 6, 1961, shortly after the 1962 models went on sale, Bunkie Knudsen was named general manager of Chevrolet, succeeding Ed Cole. Although Chevrolet was at least nominally a step down from Pontiac in price and prestige, it was GM’s largest and most powerful division. The promotion brought Knudsen a step closer to following in his father’s footsteps as president of the corporation. With his departure, Pete Estes was promoted to general manager of Pontiac and John DeLorean became chief engineer. Since Estes and DeLorean had been heavily involved in many of Knudsen’s strategic decisions, the transition was less dramatic than when Knudsen had arrived in 1956. Estes shared Knudsen’s enthusiasm for cars, but had a noticeably different management style. Where Knudsen would make a decision and trust his staff to carry it out, Estes was more hands-on, not always in a positive way. He was no martinet — former employees describe him as charismatic and highly approachable — but he was prone to micromanagement, a tendency that would later cause him considerable difficulty at Chevrolet, which operated on a much larger scale than did Pontiac. By the mid-sixties, the big Pontiacs were back to their previous dimensions; this 1966 Pontiac Bonneville is 221.7 inches (5,631 mm) long on a 124-inch (3,150mm) wheelbase. 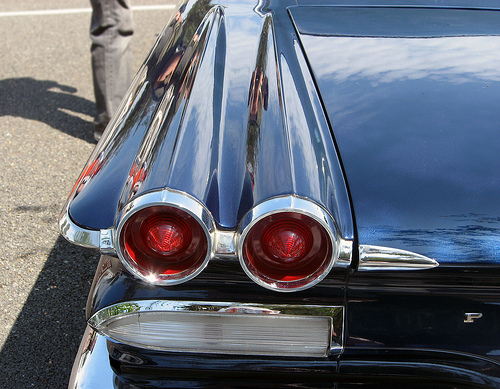 Pontiac was the style leader for the American auto industry throughout much of the 1960s and this car’s stacked-quad headlamps, complex compound curves, and flared “Venturi” fenders, created by Pontiac chief stylist Jack Humbert, make it easy to see why. These cars shared their body shell with Chevrolet, Oldsmobile, and Buick, but you’d be hard pressed to see the resemblance. Nonetheless, it would be fair to say that Estes and DeLorean did an exceptional job of cultivating the seeds Knudsen had planted. Knudsen’s tenure at Pontiac was not marked by extraordinary sales success — his best sales year was still below the peaks of Critchfield’s regime — but he had given the division a new direction, setting the stage for Pontiac’s extraordinary success in the 1960s. In 1963, the division sold nearly 600,000 cars. By 1967, it was selling more than 800,000 units a year and its market share approached 10%. 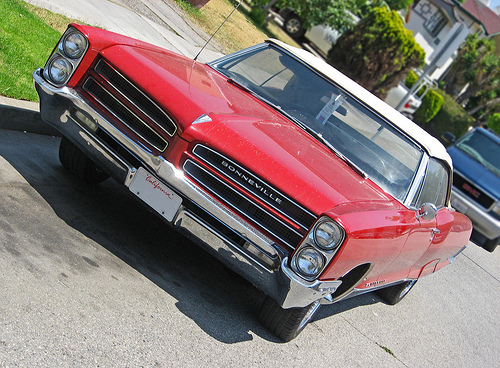 Pontiac commanded a sizeable portion of the booming youth market and Pontiac styling led the American industry. Despite the success of the A-body Tempest/Le Mans/GTO and Firebird, most of its sales were the full-sized cars, the lineage of the Wide Tracks. In July 1965, Bunkie Knudsen was promoted to group vice president, earning him a seat on the board, and two years after that became executive vice president. He had every hope of making it to GM’s top seat, but when GM president Jim Roche became chairman of the board in October 1967, it was Ed Cole, not Knudsen, who was tapped to take his place. Recognizing that his chances of succeeding Cole were slim — GM then enforced a mandatory retirement age of 65 and Knudsen was only three years younger than Cole — Knudsen departed GM to become president of Ford Motor Company in February 1968. His appointment was hailed as an industry coup, but his tenure would be short-lived. Knudsen found a bitter rival in Lee Iacocca, who also coveted the presidency, and found himself at odds with Henry Ford II, who was not prepared to allow Knudsen the kind of autonomy the Pontiac veteran had come to expect. Knudsen was fired in September 1969, barely 18 months after his arrival. Afterward, he briefly considered going into business for himself, but in 1971, he accepted the post of chairman and CEO of the White Motor, a Cleveland truck manufacturer. He retired about nine years later at the age of 68 and died in 1998 at the age of 85. Pete Estes took Knudsen’s place at Chevrolet in July 1965 and in 1974 succeeded Ed Cole as president of General Motors. Estes retired on February 1, 1981, three weeks after his 65th birthday. He died in 1988 at the age of 72. John DeLorean followed in Knudsen’s and Estes’ footsteps, becoming general manager of Pontiac in 1965 and general manager of Chevrolet in 1969. He became a group vice president in 1972, but he became increasingly frustrated with GM bureaucracy and resigned on April 1, 1973. He went on to start his own ill-fated car company, which collapsed in the eighties amid financial problems and scandal following DeLorean’s well-publicized arrest on cocaine charges (of which he was eventually acquitted). He died in March 2005 at the age of 80. After the departure of Estes and DeLorean, Pontiac’s momentum seemed to fade. Sales of the 1970 models — approved, we must point out, by DeLorean — were down almost 30% and the division’s fortunes in the seventies and eighties were mixed. Pontiac enjoyed several renaissances, but the old challenge of maintaining its distinction from Chevrolet became harder and harder. By the nineties, there was little to differentiate a Pontiac from an Oldsmobile or a Chevrolet except for plastic body cladding and “sporty” detailing. By the end, it was no longer doing even that. 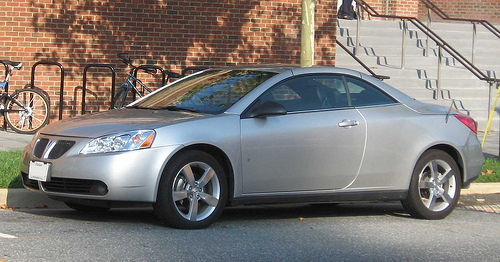 GM announced the death of the Pontiac brand on April 27, 2009, and the final car rolled off the line on November 25. Depending on how you figure it, Pontiac was either 83, 100, or 102 years old. It’s worth noting that the final Pontiac, a G6 convertible, bore the marque’s familiar twin grilles, first seen on the Wide Tracks five decades earlier — the last remnant of Bunkie Knudsen’s legacy. Our sources for this article included Arthur St. Antoine, “Art Fitzpatrick Illustrations,” Motor Trend October 2005, www.motortrend. com, accessed 13 May 2010; “AUTOS: The Biggest Switch,” TIME 16 February 1968, www.time. com, accessed 13 May 2010; “AUTOS: Why Knudsen Was Fired,” TIME 19 September 1969, www.time. com, accessed 13 May 2010; Ray Bohacz, “Mechanical Marvels: Living in the Shadow: the 1955 Pontiac 287-cubic-inch V-8,” Special Interest Autos #181 (January-February 2001), reprinted in The Hemmings Motor News Book of Pontiacs: driveReports from Special Interest Autos magazine, eds. Terry Ehrich and Richard Lentinello (Bennington, VT: Hemmings Motor News, 2001), pp. 136-138; Arch Brown, “A New Image for Pontiac: 1955 Star Chief,” Special Interest Autos #101 (September-October 1987), reprinted in ibid, pp. 44-52, “1958 Pontiac Bonneville: Like Riding on Air,” Special Interest Autos #90 (November-December 1985), reprinted in ibid, pp. 60-66, “1962 Pontiac Catalina Super Duty: Factory Hotrod,” Special Interest Autos #124 (July-August 1991), reprinted in ibid, pp. 88-95, and “SIA comparisonReport: Improbable Competitors: 1960 Chrysler 300F vs. Pontiac Tri-Power,” Special Interest Autos #127 (January-February 1992), reprinted in The Hemmings Motor News Book of Chrysler Performance Cars: driveReports from Special Interest Autos magazine, eds. Terry Ehrich and Richard Lentinello (Bennington, VT: Hemmings Motor News, 2000), pp. 54-63; John DeLorean and J. Patrick Wright, On a Clear Day You Can See General Motors: John Z. DeLorean’s Look Inside the Automotive Giant (Chicago, IL: Avon Books, 1979); Jeff Denison, “Behind the Mastermind of Pontiac’s Chief Designer Jack Humbert, The Unsung Hero of Pontiac Design,” High Performance Pontiac October 2009, www.highperformancepontiac. com, accessed 8 May 2010; Jim and Cheryl Farrell, “Continental Style: A Contest of Wills: Lincoln’s Mark IV,” Special Interest Autos #199 (February 2004), pp. 44-47; Michael Guathier, “Final U.S. market Pontiac Rolls off Production Line,” motor1.com, 26 November 2009, www.worldcarfans. com, accessed 8 May 2010; John Gunnell, ed., Standard Catalog of American Cars 1946-1975 Revised 4th Edition (Iola, WI: Krause Publications, 2002); David Halberstam, The Reckoning (New York: William Morrow and Company, 1986); Dave Holls and Michael Lamm, A Century of Automotive Style: 100 Years of American Car Design (Stockton, CA: Lamm-Morada Publishing Co. Inc., 1997); John Holusha, “Semon Knudsen, 85, Dies; Was Prominent Auto Executive,” New York Times 9 July 1998, www.nytimes. com, accessed 8 May 2010; John F. Katz, “1960 Pontiac Bonneville Vista,” Special Interest Autos #172 (July-August 1999), reprinted in The Hemmings Motor News Book of Pontiacs, pp. 68-77; “Knudsen, Semon E.,” Generations of GM Heritage, GM Heritage Center, n.d., history.gmheritagecenter. com/wiki/ index.php/ Knudsen,_Semon_E., accessed 8 May 2010; Richard M. Langworth, “1957 Pontiac Bonneville: Look What’s Happened to Grandma!” Special Interest Autos #48 (November-December 1978), reprinted in ibid, pp. 54-59; Pete Lyons, “1958 Pontiac Bonneville,” Car and Driver Vol. 32, No. 1 (July 1986), pp. 71–78; “Motor Trend Award to the 1965 Pontiacs,” Motor Trend Vol. 17, No. 2 (February 1965), pp. 26-79; Edward Niedermeyer, “Pontiac Is Still Dead,” The Truth About Cars, 25 November 2009, www.thetruthaboutcars. com, accessed 8 May 2010; Jan P. Norbye and Jim Dunne, Pontiac 1946-1978: The Classic Postwar Years (Osceola, WI: Motorbooks International, 1979); Joe Oldham, “Archival Ponchos: The Complete History of Pontiac Performance,” Cars April 1973, pp. 24–30, 94, 112; Chris Paukert, “Officially Official: GM kills Pontiac,” [based on and incorporating GM’s press release of that date, “GM Accelerates its Reinvention as a Leaner, More Viable Company”] AutoBlog, www.autoblog. com, accessed 8 May 2010; “Pontiac’s Chiefs,” Motor Trend Vol. 17, No. 2 (February 1965), pp. 76–79; Richard Rauch, Rich’s Classic Pontiac Server, 1997–2001, www.pontiacserver. com, accessed 12 May 2010; Daniel Strohl, “Semon ‘Bunkie’ Knudsen,” Hemmings Muscle Machines #46 (July 2007); and Anthony Young and Mike Mueller, Classic Chevy Hot Ones: 1955–1957 2nd ed. (Ann Arbor, MI: Lowe & B. Hould Publishers, 2002). Some additional details came from the author’s telephone conversations with Jim Wangers on 8 September and 17 September 2009. We also consulted the following period road tests: “Pontiac Road Test,” Motor Life January 1955; “Pontiac Star Chief,” Road Test 1956; Otto Zipper, “Road Test: Two Pontiacs,” Motor Trend March 1957; “Pontiac Road Test,” Motor Life March 1957; Jim Whipple, “Car Life Consumer Analysis: 1958 Pontiac,” Car Life March 1958; “Pontiac Road Test,” Motor Life April 1958; William Carroll, “I road tested a STOCK 146-MPH PONTIAC!” Motor Life June 1958; Ray Brock, “Pontiac – 3000 Mile Road Test,” Hot Rod December 1958; “Pontiac Road Test,” Motor Life January 1959; Duncan Maxwell, “318-HP Pontiac,” Cars December 1959; and Ray Brock, “1960 Pontiac Tempest,” Hot Rod May 1960, all of which are reprinted in Pontiac Limited Edition: 1949-1960, ed. R.M. Clarke (Cobham, England: Brooklands Books Ltd., ca. 1999).